Igor Urizar teaches Syrian refugees to ski on the slopes of Iraqi Kurdistan. Credit: Nuzha Ezzat/IPS. PENJWIN, Iraqi Kurdistan, Feb 16 2014 (IPS) - No one here has heard of the Sochi Winter Olympics. But the snow conditions are perfect in these Kurdish mountains of Iraq and 11-year-old Syrian refugee Hassan Khishman is thrilled to glide on skis for the first time. “It’s brought back the good times with friends in Syria,” the Syrian Kurd boy tells IPS after sliding down a tiny slope. Located on the Iranian border around 300 km northeast of Baghdad, the mountain village Penjwin was known as a major hub of refugees fleeing Saddam Hussein’s campaigns. Smugglers’ caravans still cross these rugged border valleys with all sorts of goods packed on mule backs. Mines continue to pose a major concern. But the area where locals have been skiing has been carefully chosen to avoid cruel surprises. War is becoming a distant memory for these highlanders. For some children like Hassan, the slopes have thrown up a happy surprise. 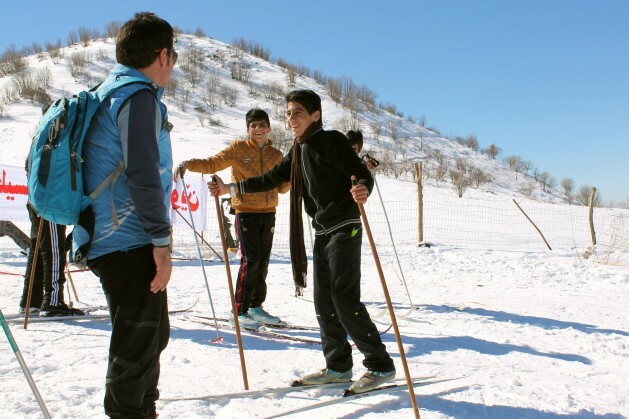 The youngsters have been brought here from refugee camps at the initiative of ski instructor Igor Urizar – a Spaniard who set up Iraq’s first ski school here – to help them escape the bitter memory of war. “We fled Syria because of the war. There were many among us who died, and the food became very expensive,” says Hassan who left his native town Hasakah and crossed the border almost a year ago. He now lives in the Arbad refugee camp in Suleymania province, 260 km northeast of Baghdad. It is one of six refugee settlements in the Kurdish autonomous region. According to the UN, over 200,000 Syrian refugees have taken shelter in Iraq’s stable northern region. Huddled in tents, they’re all facing one of the coldest winters ever recorded in the region. Helin Kaseer is three years older than Hassan and could identify those who forced her family to flee Girke Lege, a Kurdish village. “We left Syria eight months ago because of the growing presence of Islamists in our area. There was a lot of fighting and several of my friends were kidnapped, so we couldn’t go to school,” explains the girl. Urizar, the man who initiated the skiing opportunity for the children, explains why the other children had to be left out. “We have just enough equipment for a few dozen. Besides, getting the necessary permission for them to leave the camp for just one day has been a real nightmare,” says 38-year-old Uzirar, who planted the seeds of skiing in a place as improbable as Iraq. Before his first visit to Penjwin in 2010, Urizar was a ski instructor in the northern Spanish region Navarra where every year about 5,000 schoolchildren enjoy a week of skiing in the Pyrenees. With the support of the Tigris Association, a Basque-Kurdish NGO, his dream to export this project to the Kurdish mountains seems to be on the right track. Local villagers as well as government officials are thrilled with Iraq’s first ski school here, and the second set up in Ranya, 430 km northeast of Baghdad. Falah Salah, the Tigris local coordinator, ensures that the skiing project continues with the personal backing of Hero Khan, the wife of Iraqi President Jalal Talabani, for the second consecutive year. Salah is planning to run for the Iraqi parliament in elections in April, so he’s passing on the baton to Khalid Mohamad Qadir, head of Penwjin’s Youth Centre. “Three years ago, Tigris invited us to the Pyrenees to check the possibilities of cross-country skiing as part of sustainable development,” explains Qadir, as he tries to manage a bunch of anxious children waiting for their turn. “Over the past two years, the Roncal Valley Ski School has trained young Kurds who are now teaching a growing number of visitors in our area. Most of them are Kurdish but we have recently had people from France and Holland too,” he says. After putting on his boots over three pairs of socks, Mohamed Ibrahim is ready. The 13-year-old native of Tirbespiye, 600 km northeast of Damascus, smiles but says that nothing can help him forget what he witnessed in Syria. “The jihadists began to harass and kill us in our area. There was no food, no oil. So we left just at the first opportunity to escape. I’ve never been so scared in my life,” he tells IPS. As the children jump on a bus back to the camp, just before the sun sets behind the snow-capped peaks, Urizar seems relaxed. It has been a hectic and stressful week due to bureaucratic hurdles and rain forecast which, thankfully, proved wrong. “I cannot help thinking that these kids will have to sleep in those tents again,” says Urizar, drying the skis before putting them away.